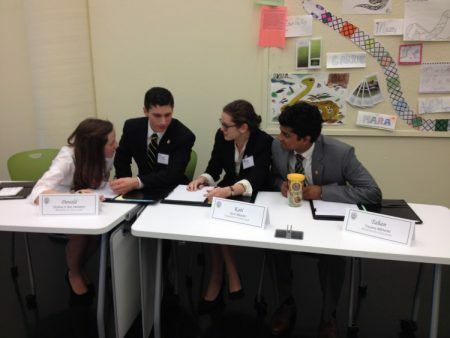 Members of the 2016 Ethics Bowl team discuss strategy at the 2016 competition. Three students from Randolph College will participate in the Virginia Foundation for Independent Colleges’ (VFIC) 18th annual statewide collegiate Wells Fargo Ethics Bowl on February 12-13 on the campus of Virginia Wesleyan College in Norfolk, Virginia. The Randolph College team will compete head-to-head against other highly qualified student teams from Virginia’s 15 leading independent colleges and universities, deliberating a variety of case studies highlighting ethical dilemmas. The members of the Randolph College student team are Christian Ridenour ’18, Danish Roshan ’18, and Katya Schwab ’17. The faculty coordinators for the team are philosophy professor Kaija Mortensen and political science professor Vincent Vecera. Many notable individuals from a variety of career fields including business, law, education, finance, journalism, and others will listen to team presentations and offer reactions to the students’ presentations. The Ethics Bowl program will commence with an opening session on Sunday, February 12, at 2:30 p.m. at Virginia Wesleyan College’s Blocker Hall, with the first matches scheduled for 3:30 p.m. in various classrooms throughout the building. On Monday, February 13, rounds 3 and 4 will begin at 8:45 a.m. The final round of competition will take place at 11:15 a.m. in the Blocker Hall Auditorium. The public is invited to attend the match sessions free of charge. The winning team will be announced at 12:30 p.m. on Monday. The team from Hampden-Sydney College took home the Batten Trophy at the 2016 Ethics Bowl. Founded in 1952, the Virginia Foundation for Independent Colleges is a nonprofit fund-raising partnership supporting the programs and students of 15 leading independent colleges in the Commonwealth: Bridgewater College, Emory & Henry College, Hampden-Sydney College, Hollins University, Lynchburg College, Mary Baldwin University, Marymount University, Randolph College, Randolph-Macon College, Roanoke College, Shenandoah University, Sweet Briar College, University of Richmond, Virginia Wesleyan College, and Washington & Lee University. For additional information on the VFIC, visit www.vfic.org.